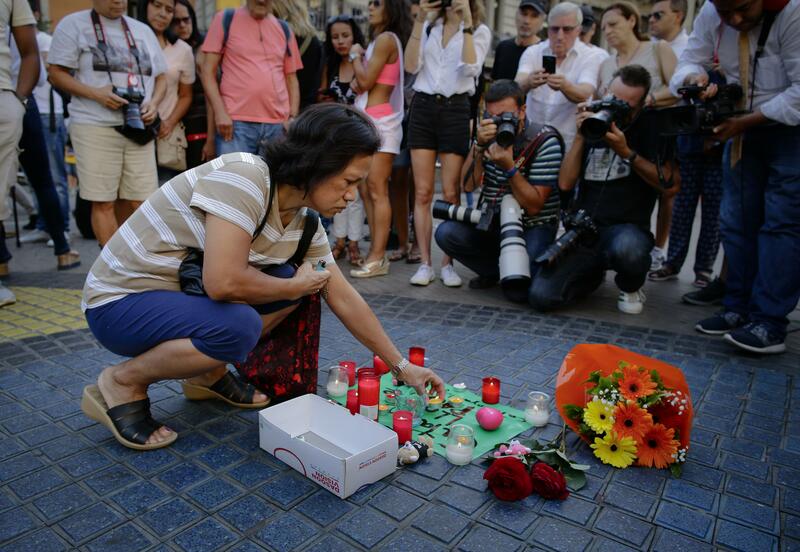 PARIS The dead and injured in Barcelona were a snapshot of the world – men, women and children from nearly three dozen nations – testifying to the huge global appeal of the sun-kissed city. Families, friends and government officials from Paris to Sydney, San Francisco to Berlin scrambled Friday to discover whether their loved ones and citizens were among those mowed down by suspected Islamic extremists who zig-zagged down Barcelona’s always crowded Las Ramblas promenade in a van, killing 13 people and injuring more than 100 others. One of Italy’s two victims in the Barcelona van attack is being mourned as a brilliant young engineer dragged to his death before his girlfriend’s eyes. “We were investing in him, we wanted to make him grow professionally,” the Italian news agency ANSA quoted Stefano Facchinello, one of the partners in the Padua area company where Russo had worked for a year, as saying. One of his Gulotta’s work colleagues, Pino Bruno, told the Italian news agency ANSA that he saved the life of his two young children – Alessandro, 6, and Aria, 7 months – by throwing himself between them and the van that mowed people down. “Everyone knelt down, instinctively, as if to protect themselves,” Bruno said, adding that Gulotta put himself in front of his children and was fatally struck. Gulotta was a sales manager for Tom’s Hardware Italia, an online publication about technology. “Rest in peace, Bruno, and protect your loved ones from up high,” read one tribute on the company’s web site. One of his nieces, Raquel Baron Lopez, said on her Twitter account that Rodriguez, 60, died immediately when he was struck by the van. After the attack, Lopez posted pictures of her uncle on Twitter when his family was looking for him and trying to find out whether he was alive. The mayor of Lanteira, the southern town in Spain where Rodriguez was born, confirmed his death. Arnould Partoens, president of the KFC Heur Tongeren soccer team, said Vanbockrijck was at the club “nearly every day” ferrying her 10- and 14-year-old boys back and forth to training and matches. He described her as very committed. “She was always positive,” he said in a phone interview. He said the team would hold a minute of silence before every match and training session this weekend. “The mother was in the wrong moment and the wrong place,” he said. His sister, Tina Luke, told the Associated Press that Tucker and his wife, Heidi Nunes-Tucker, were celebrating their honeymoon in Barcelona. She said they married a year ago and then saved up for the trip. Tucker’s wife told NBC News they were having drinks at a patio when her husband, 42, said he was going to the bathroom. Tucker is listed as missing and hasn’t been found among the 120 injured. Diana Gray, a neighbor of the couple in Lafayette, California told AP they were happy, loving and had a lot of friends. Published: Aug. 18, 2017, 8:36 a.m. Updated: Aug. 18, 2017, 11:15 a.m.